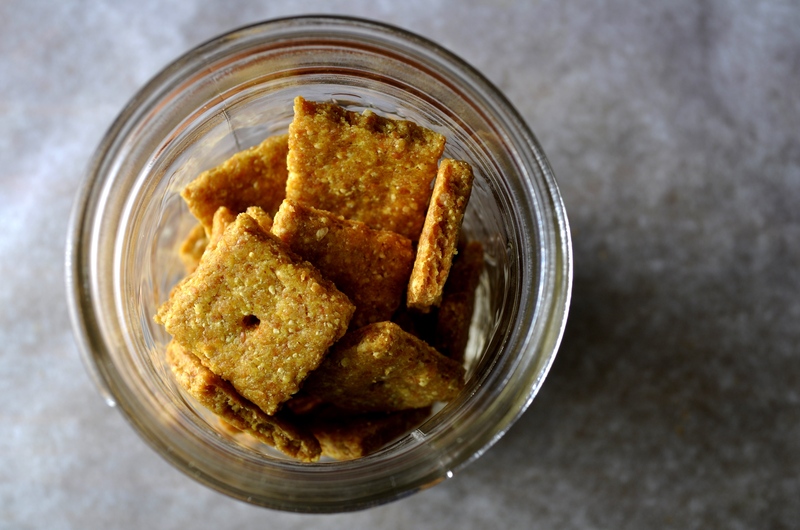 A quarter cup of Earth Balance soy free ‘butter’, one cup of Daiya ‘cheese’ (any flavor will do), one cup of spelt flour, half a teaspoon of turmeric, half a teaspoon of sea salt and two tablespoons plus one teaspoon of cold water. THIS is what you need to make our version of vegan cheez-bits. I have to say that I have never tried the original, but these are pretty darn tasty and I bet they will disappear from the lunchbox. Place the Earth Balance into your food processor with your Daiya cheese and process until combined. Add in the dry ingredients and process again. Add in the water and mix for another five seconds. Put the mixture into a bowl and get your hands in there. Squish is all about and form into a disc. Place it in the fridge for thirty minutes and then you’re ready to roll…literally. Roll the dough out fairly thin and slice into strips and then squares with a pastry cutter. Bake on a parchment lined cookie sheet in a 350 degree oven for fifteen minutes. Turn the oven off and leave then in there to crisp up for another thirty minutes while the oven cools off. Store in an air tight container (or in the freezer) and enjoy! 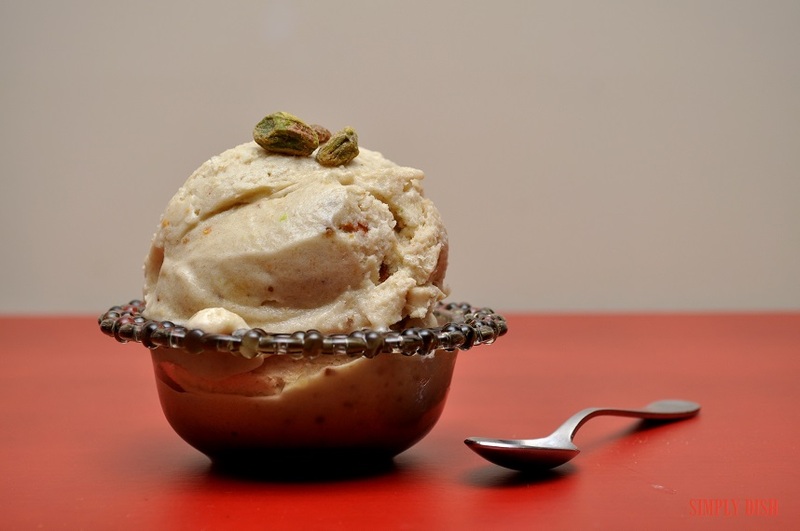 Banana Pistachio Cardamom Ice Cream! Slice your bananas and place them into the freezer for at least four hours…today we left ours for eight. Once they are frozen, place them into the food processor with the remainder of the ingredients and process until smooth. Serve right away or store in the freezer. Top with a few pistachios and enjoy! 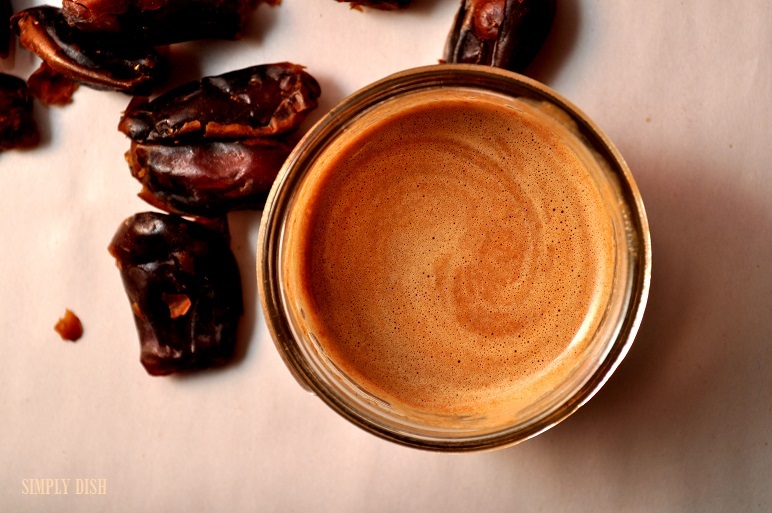 Process until slightly warm, pour into your favorite glass, sit back and enjoy!